MP3-OGG-WAV-WMA Converter converts audio formats MP3, OGG, WAV, WMA from one to another, such as converting MP3 to WAV and WMA, WAV to MP3 and WMA. MP3-OGG-WAV-WMA Converter supports the ability to convert one audio format to the same format with different audio-encoding parameters such as resampling, tag information and bit rate. 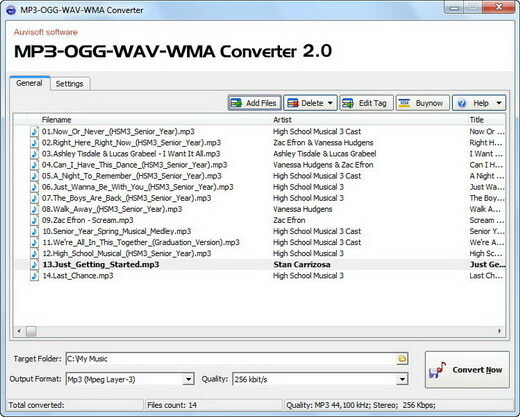 MP3-OGG-WAV-WMA Converter's easy-to-use interface makes it easy to convert multiple files in a single batch, regardless of their sources and target formats.